Fogdan (aka Dan Nowicki) has an eclectic style, rooted in blues, but continually branching out into other genres when sparked by creative ideas. Nowicki was born and raised in Toledo, Ohio; he now lives in Colorado Springs, CO. Electric Bear Studiosâ€™ Kristaâ€™s Kingdom featured music from Fogdanâ€™s Blues, Boogie and Beyond. Prior to the series release, Nowicki picked up a Florida Picture Television Association award for best music composer. Fogdanâ€™s newest CD Reflections Inside Out is due for release in late June. Nowickiâ€™s latest work is a collection of upbeat yet relaxing songs that will help you wind down at the end of the day, or put you in a great mood at any time. Mostly instrumental with a few vocal arrangements, this CD can help ease the commute either way! End of Night is a light and hopeful song, focusing on the value of love and positive relationships. Firefly is more reflective and evokes images of the forest and mountains. Campfire opens up with a slightly faster tempo â€“ a great song for the open road. "Party Arty On" Reviewed by RadioIndy.com! 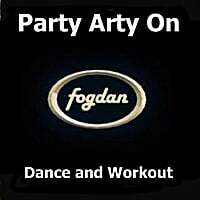 You will be dancing to the grooves in no time when you hear the fantastic Electronic Dance music on the brilliant CD, “Party Arty On,” by the musical artist Fogdan. This album is bristling with vibrant energy and pulsating beats. As you hear each track you will feel energized as these fun melodies ignite with a magnetic appeal. The infectious opener, “Dreaming of You,” buzzes with a fury of electronic rhythms and soulful vocals. The title track, “Party Arty On,” reels you in with its irresistible melody and a rich musical texture. Another song, “The Cool Down,” has a funky groove as the synth sounds weave a rich and flavorful melody while the percussion keeps a strong and solid tempo. If you are looking for new Electronic music to dance to or maybe even workout to, then take a listen to the magnificent CD, “Party Arty On,” as you won’t be disappointed by this electrifying album. This CD is great for dance or for working out. Upbeat and fun, Techno to dance and some with female vocals.